In house Tool and Die Design has proven to be an extremely economical means of getting your parts to production. By using our in house tool and die design you eliminate a significant time delay by not having to wait on a third party company to produce what you need. Our in house tool and die design team has extensive experience with progressive dies, pierce and cutoff dies, compound dies, and form dies. This experience translates into immediate time and money savings for you, our customer. The same expert tool and die design team that quickly and economically produces your production tooling is also on staff in our production facility; allowing then to quickly respond to repair and maintenance issues which better enabling us to deliver your products on time – like you expect. Furthermore, our routine maintenance program will ensure you quality production and extend the life of your tooling. APT’s fully equipped tool room allows our tool and die design team to specialize in hand transfer dies, complex progressive dies, draw dies, and compound dies. Rapid prototyping and design enhancement is now available in one seamless process. Whether we build your original tooling or modify and sharpen your existing tooling, our tool and die design department will exceed your expectations. 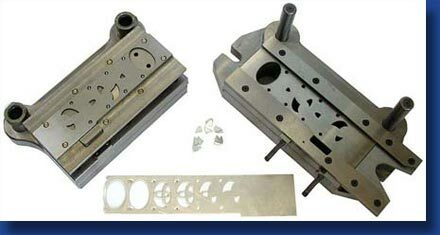 Compound Dies are applicable in many metal stamping operations. When metal stamping part requires more than one feature to be stamped and these operations can be run independently of one another, a compound die can be used. Compound dies will provide multiple metal stamping features with each stroke of the press. Furthermore, compound dies provide excellent part flatness. A Deep Draw Die is suitable for metal stamping parts when the material is required to flow or stretch, as opposed to being bent or formed. It is common for deep draw dies to require multiple steps in order to achieve a significant depth. Form Dies are probably the most common metal stamping dies used in the industry. Form dies can be very simple to moderately complex. Form Dies are normally less expensive to manufacture than progressive metal stamping dies, Compound metal stamping dies, and Deep Draw metal stamping dies.